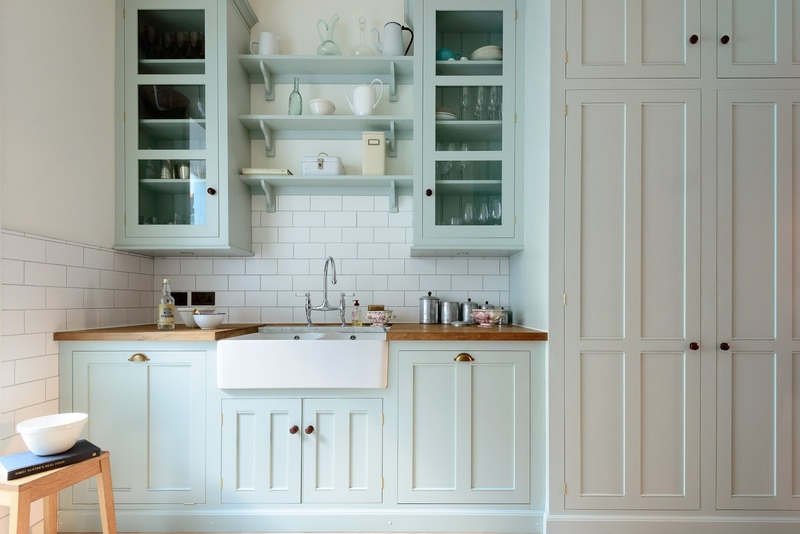 I love a White kitchen. We bought our previous home from the builder, so we had the fun of choosing all our finishes. 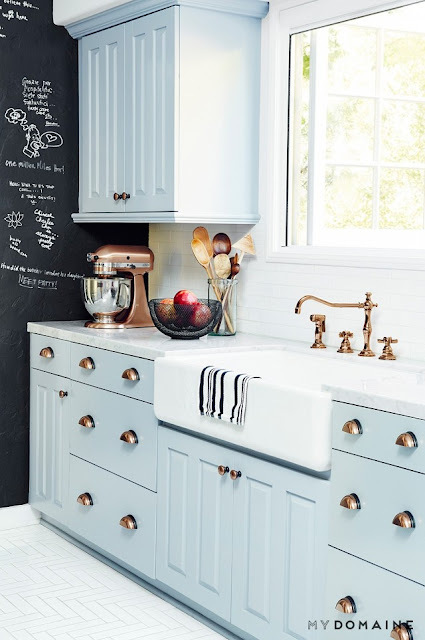 I was so excited that I would be able to choose my dream kitchen - a White Kitchen with modern stainless steel hardware and a quartz counter top that resembled carrera marble. Unfortunately in this house, quartz is not in the budget. We went a little overboard with spending in our previous two homes, which meant we had a gorgeous place to live but left us in a bad place financially, but I'll save that for another post. In this house, any updates we make (I have a long list already), have to be made with CASH. No borrowing money to make our house look beautiful. If you follow me on Pinterest you may have noticed that I've been Pinning a lot of Pins about updating outdated Kitchen Cabinets. 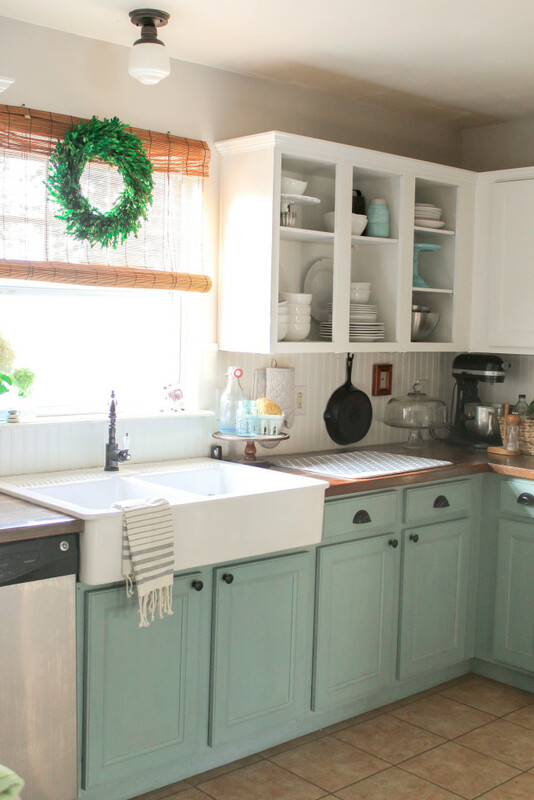 Our kitchen cabinets in this house are the original cabinets from 1995 and need a major face lift. A brand new kitchen isn't in our budget so I turned to Pinterest for some ideas and came across the photo below. I love the costal vibe of this kitchen. I remembered that I have bluish gray paint in my mudroom that would be perfect for my kitchen makeover on a very limited budget! I normally like to stick to greys and whites with paint but ever since we did the bold blue door in Luca's Room Makeover I've had the itch to step outside my comfort zone again. 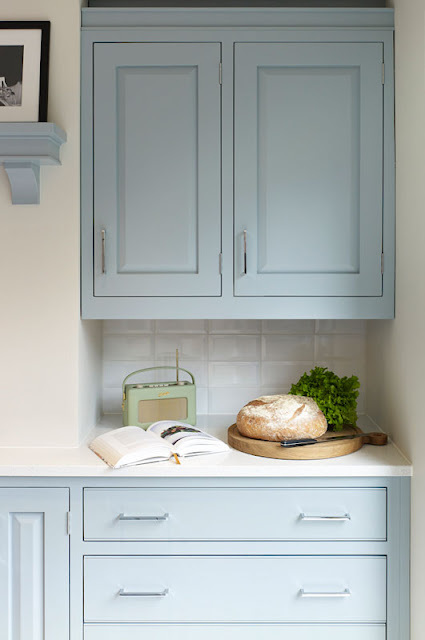 I started searching for more photos of blue kitchens and loved what I found! C- Nothing great ever comes from staying inside your comfort zone. 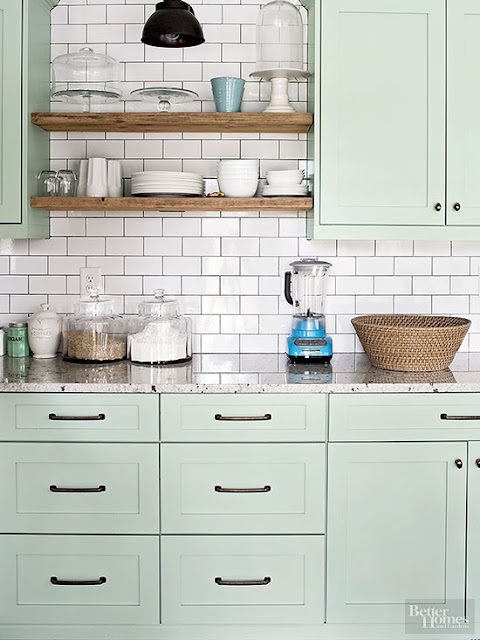 Here are some of the other kitchens I fell in love with in my search. Would you ever paint your kitchen cabinets a shade of blue?